From the minute I picked up the iPad Air at Apple’s event in San Francisco last week, I knew it was going to be different. Apple set expectations very high by simply using the “Air” moniker for the new iPad, giving users thoughts of a lightweight, powerful, professional device, similar to how they think of the MacBook Air. I must admit, at first I was wondering if the new iPads Apple had on display at the event were prototypes—empty fakes that didn’t actually work, but showed what the form-factor would be like when they were released. I’m pleased to say that they were the real thing. The other thing you will quickly notice is that while the screen size of the iPad Air is the same as the previous generation, the Air is actually a smaller device. The height is the same, but the width is considerably narrower. Apple made the distance between the edge of the screen and edge of the iPad smaller on both sides, accounting for the smaller size. 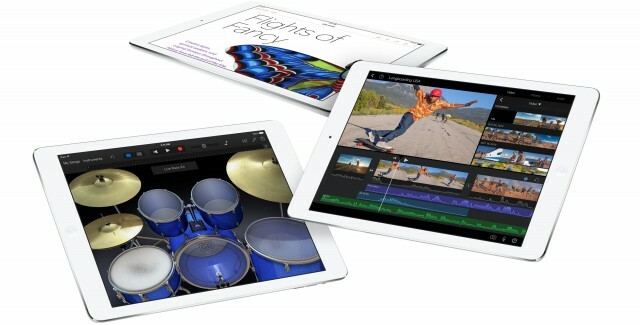 The iPad Air now resembles the iPad mini in that respect. This smaller size is great. If you have decent sized hands you can type with two thumbs on the iPad in portrait, something I wasn’t really able to do with the last generation iPad without a lot of stretching. Clearly a full-size iPad is not something you will be thumb typing with all the time1, but it does give you an idea of how much smaller the iPad Air is. 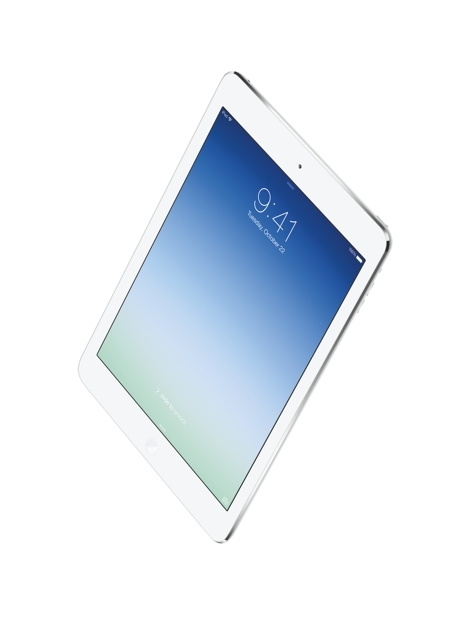 The iPad Air also comes with Apple’s A7 chip, the fastest chip the company has manufactured to date. Power has never been something I worried about on an iPad and I certainly won’t be worried with this new version. The A7 is a 64-bit chip that is packed with power. There aren’t any apps or any situation that I have tried or can think of that would slow down this iPad. In fact, the A7 chip has twice the processing power and graphics performance as the A6X chip found in the iPad 4. That’s an astounding amount of power increase for a single generation. The Air is also equipped with the M7 chip, a new coprocessor first introduced on the iPhone 5s. The M7 takes data from the accelerometer, gyroscope, and compass and can deliver that information to apps without accessing the A7. This ultimately means power savings for the user because the more power hungry A7 doesn’t have to work at gathering that information. Speaking of power—let’s talk about the battery. I don’t use my iPad all day, every day, but I do use it on occasion throughout the day. For instance, if I have an appointment, I’ll take the iPad with me and do some writing. I did that today. I sat for a few hours today, utilizing LTE for Internet, and writing in Byword. I was doing simple things really—nothing that was taxing for such a powerful device, but still important work for me. I used it a few more times during the day for research, email, surfing the Web and other such tasks. I wrote and edited part of this review on it. As I type this, there is 84% of my battery remaining. Not bad for having a device at my disposal all day long, ready to do anything I need. I always opt for the cellular model iPad because I think it’s the smart choice. We can have Internet almost anywhere we go these days and I want that option. We can get very cheap data packages, so why not do that. My wife never gets the cellular model and it came back to bite her on a couple of occasions—the last time was just before I left for the Apple event. We were going to see a new puppy at the dog rescue she volunteers for. She had the address on her iPad mini, but forgot to bring up the email before we left the house. Of course, when she did try to search for it, we were on the road without a connection. We had to stop at a coffee shop, get a Wi-Fi connection and find the address. It was a pain, but we had little choice2. The last thing that stood out to me with the iPad Air are the apps. I usually don’t talk about apps when I look at an iPhone or iPad, but this time, they deserve a mention. It would have been great for users if Apple released iLife and iWork free for its users. Instead, the company updated iPhoto, iMovie, GarageBand, Pages, Numbers, and Keynote and then made them free. This is a huge win for users. Apple is giving away the OS and now it is giving away all of the apps people need to do work and have fun. Everything you need is free. It’s not just that the apps are free that’s impressive—it’s that they are really good apps. I spoke at a conference in San Francisco last week after the iPad event, so I had a chance to use the apps in real-world circumstances. I worked on my Keynote presentation on my iPad, made notes in Pages on my iPhone and worked on The Loop Magazine payments in Numbers, all while sitting in Union Square enjoying a coffee. When I got back to the hotel, all of my work was available on iCloud when I turned on my Mac. That’s powerful and efficient. I got things done. That’s what software and hardware are supposed to do for you. That’s what the iPad Air and iWork did for me.